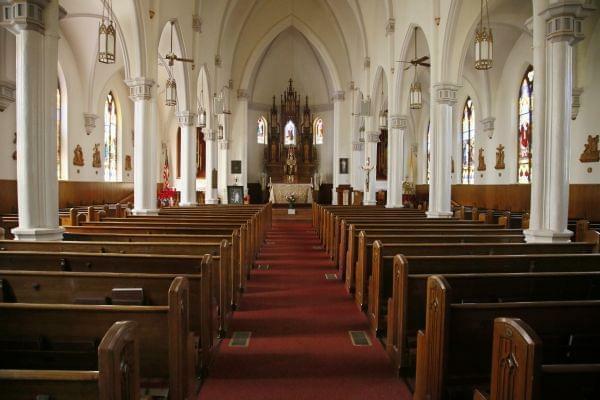 The interior of Holy Trinity Catholic church. Lawyers representing victims of sexual abuse by Catholic clergy have released a public list of accused clergy in Illinois. We hear from one of those attorneys, and the archdiocese of Chicago. Plus, ‘crime-free’ housing rules are meant to reduce crime in rental properties, but landlords, tenants, and police are divided over whether these rules are too broad. Last week, attorneys representing clergy abuse victims presented a report which details the alleged sexual misconduct by nearly 400 Catholic clergy in Illinois. Heidi Schlumpf: National Correspondent, National Catholic Reporter, based in Chicago. Across Illinois, dozens of communities have been implementing ordinances aimed at addressing crime in, and around, rental properties. They’re called ‘crime-free housing’ programs. Most say that if someone in the home is connected to a crime, the tenant can lose their housing. Supporters say these rules help reduce crime. But some say these crime-free ordinances are too broad, and disproportionately target communities of color. 'Crime-free housing’ programs have been implemented at & around rental properties in dozens of IL communities reports @maryfhansen @nprillinois.